The Avanti S 1.9m Jet ARF was designed by Italian aerobatic pilot, Sebastiano Silvestri and is just the right size between the Mini Avanti and the larger 79-inch turbine Avanti S. This sport jet model is largely designed off the full scale BAE Hawk and modified by adding the ultimate aerodynamic ideas of modern pattern models. Combined with Sebastiano’s 15 years of experience in flying jets, the result are surprising! The innovative design of the Avanti XS is due to the combined lightweight composite fuselage and built up wood flying surfaces which allows the Avanti S an impressive precision and smoothness at any airspeed and flight condition. 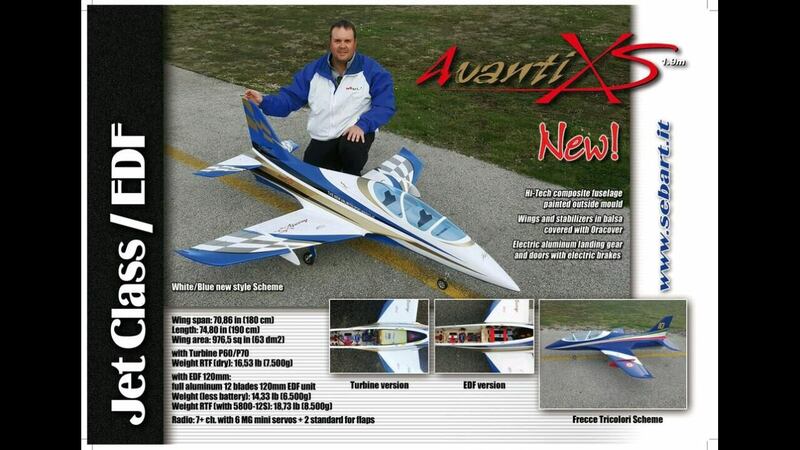 The Avanti XS can be flown with a 12 Blade 120mm EDF unit with 12S 5800 mAh LiPo power or a P60 to P70 Turbine, either way this sport jet will perform!